The Massachusetts Mutual Life Insurance Company headquarters on Main Street in Springfield, around 1892. Image from Picturesque Hampden (1892). 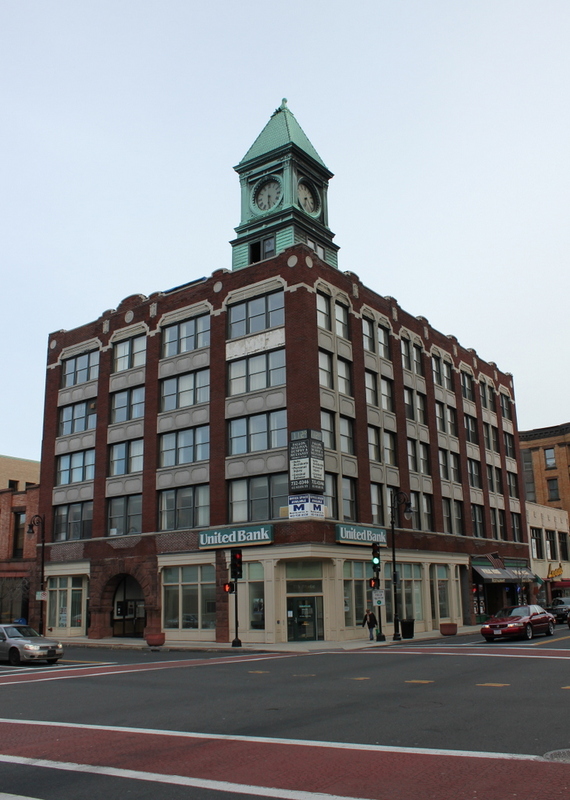 The Massachusetts Mutual Life Insurance Company was established in Springfield in 1851, and originally had its offices in the Foot Block, at the southwest corner of Main and State Street. Its first president was Caleb Rice, a lawyer and politician who also served as the first mayor of Springfield, from 1852 to 1853. He went on to serve as president for the next 22 years, until his death in 1873, and during this time the company saw substantial growth. [O]n the evening of Feb. 5, 1873, a fire broke out in the lower part of the building (which was rented for mercantile purposes), and raged all night, destroying all the rear and much of the front of the structure. The company’s safes, and most of its books and papers, were preserved; and business was transacted, with but little interruption, in temporary quarters in the Hampden House Block on Court Street. By December of the same year  the company’s own building had been rebuilt, re-arranged, and improved, under the supervision of George Hathorne, the New-York architect, and its own offices were re-occupied. 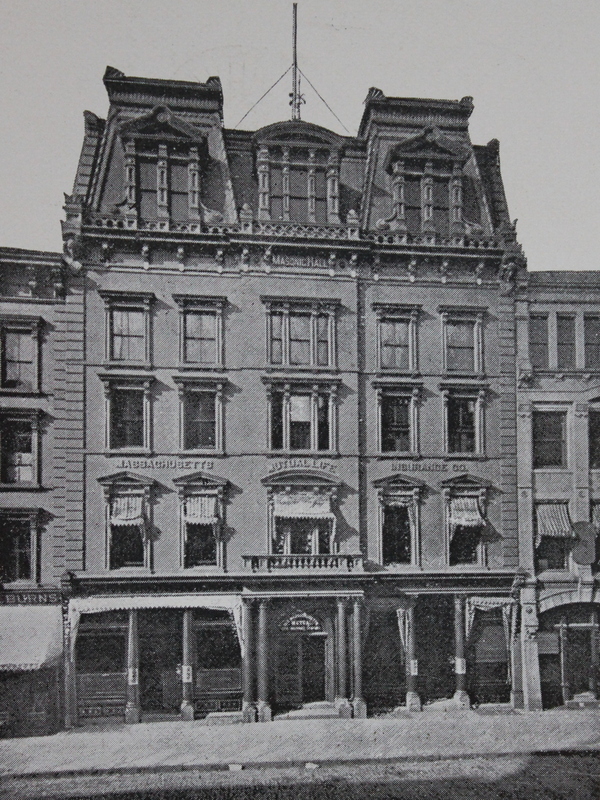 The lofty brown-stone front and iron mansard roof form a handsome and conspicuous feature of the street; while the Masonic lodges and other organizations that occupy the floors over the company’s offices, and the stores that are on the ground floor, make the inside of the building familiar to a great number of people. Massachusetts Mutual continued to have its offices here in this building for several more decades, and for many years the company shared it with the Freemasons, who occupied the two upper floors. This arrangement was still going on when the first photo was taken in the early 1890s, as it shows the words “Masonic Hall” above the fourth floor windows, along with “Massachusetts Mutual Life Insurance Co.” above the second floor. 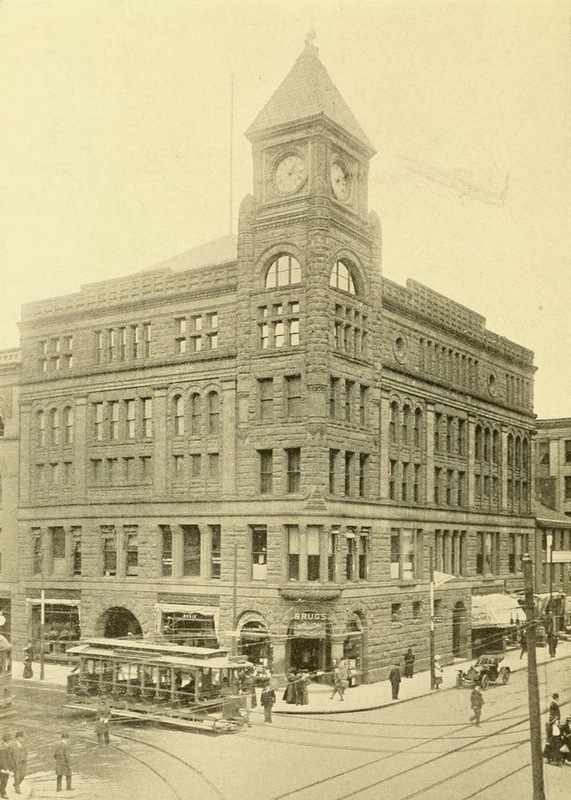 However, the Freemasons moved out of this building soon after the first photo was taken, upon the completion of their own building at the southeast corner of Main and State Streets in 1893. About 15 years later, Massachusetts Mutual followed the Freemasons to the same street corner. 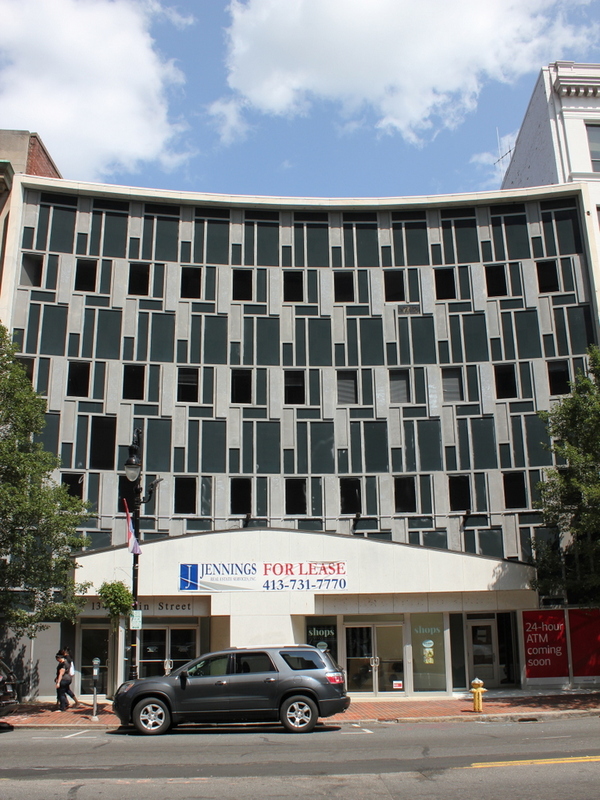 The old Foot Block, where the company had begun in a single room, was demolished and was replaced by an eight-story, Classical Revival-style building that still stands at 1200 Main Street. 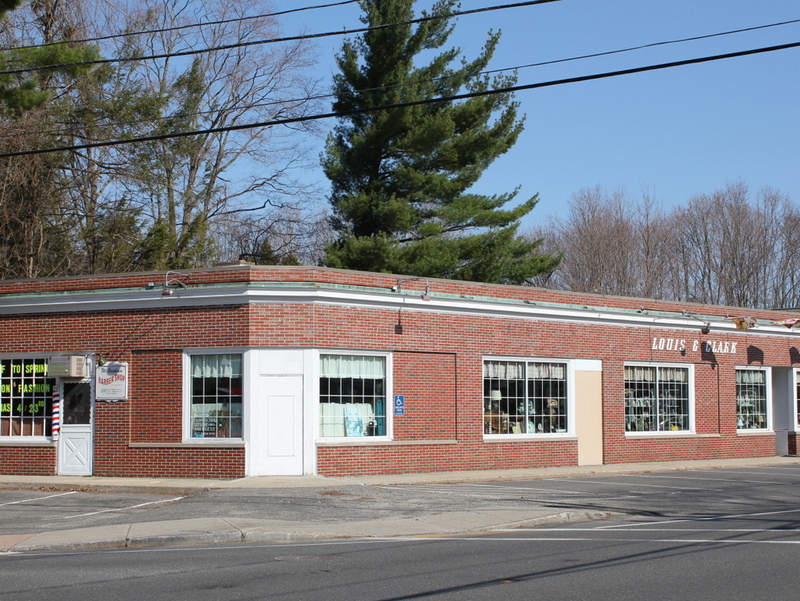 This new building was only used for a fairly short period, though, before the company relocated to its current headquarters on State Street in the Pine Point neighborhood. In the meantime, the old 1868/1873 building stood here on Main Street for many years after Massachusetts Mutual moved out. It can be seen in the late 1930s photo in the previous post, and it was still recognizable despite alterations to the two lower floors. At the time, the building housed the Weeks Leather Store in the storefront on the left, and the Ann Lewis women’s apparel store on the right. However, it was ultimately demolished sometime before the late 1950s, when the current Modernist-style building, with its distinctive curved front facade, was built on the site. 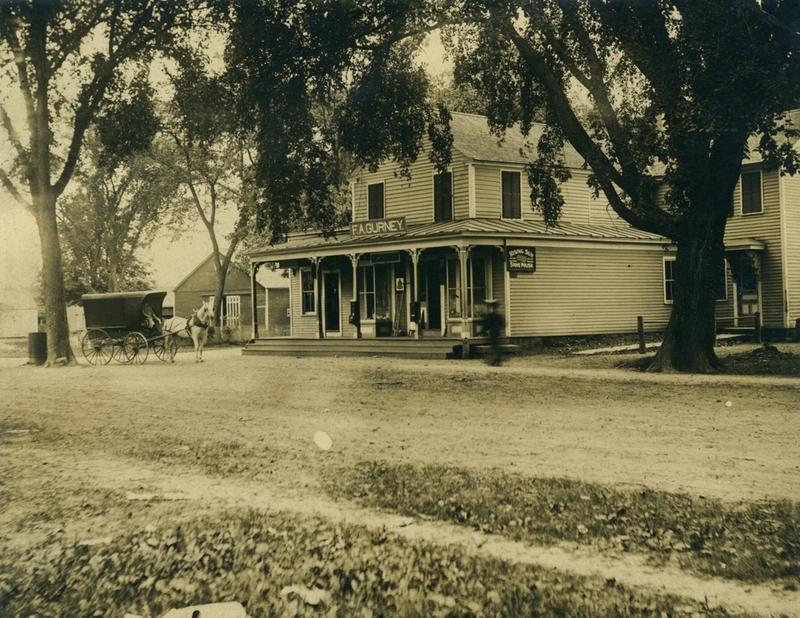 Another view of Gurney’s Store, at the corner of Main and Springfield Streets in Wilbraham, around 1904. Image courtesy of the Wilbraham Public Library. This scene shows the general store at the corner of Springfield and Main Streets as it appeared when Frank A. Gurney ran the store. As mentioned in this post, the store was owned by several different people around the turn of the last century, with Gurney bring the one most commonly associated with the building. His delivery wagon can be seen in this post, and his primary business was selling goods to farmers in the area, although he probably also saw a fair amount of business from students at nearby Wesleyan Academy. Gurney was out of the building by 1913, and it was used as a post office and Masonic Lodge until it was demolished in 1957, and for many years afterward this was the site of the Louis & Clark drugstore. 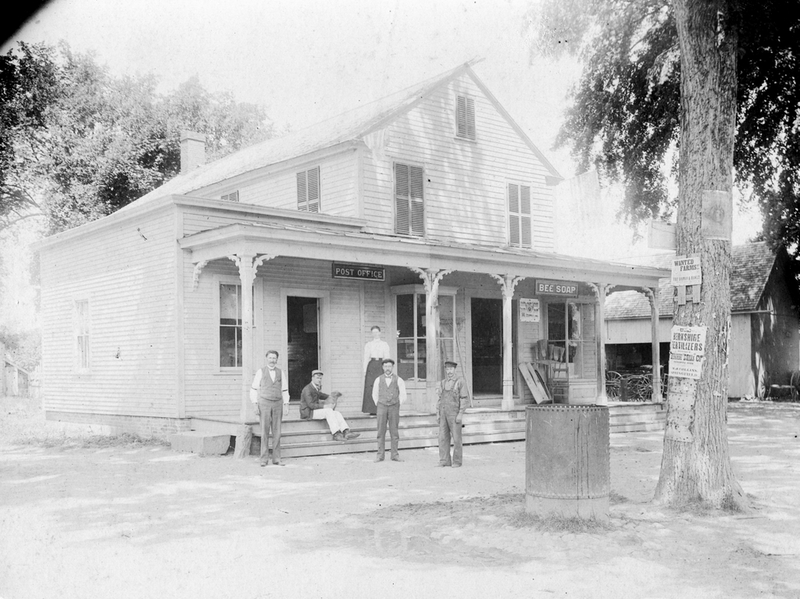 Frank A. Gurney’s Store, at the corner of Main Street and Springfield Street in Wilbraham, probably around 1900. Image courtesy of the Wilbraham Public Library. I don’t know whether Frank Gurney used the building at the time that the first photo was taken, because it was used as a general store by several different men in the early 20th century. 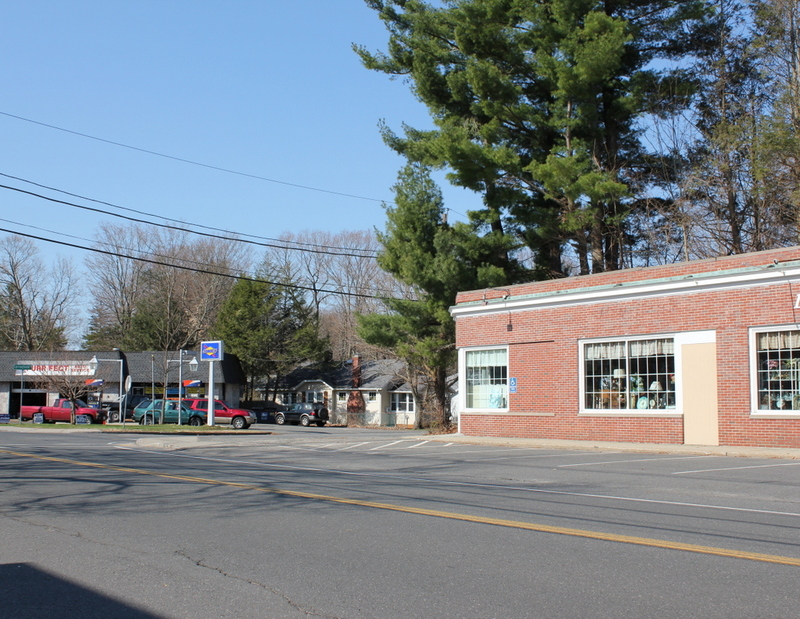 However, it is most commonly associated with Gurney, whose carriage can be seen directly across the street from this building in the first photo of this post (note the watering trough, which is seen both in that post and here). The tree next to the trough was apparently used as a sort of community bulletin board, which reveals the occupation that most Wilbraham residents were involved in – farming. The bottom handbill advertises for Berkshire Fertilizers, above it is one that exclaims “WANTED FARMS! !”, and then above that is another ad for a fertilizer company. As for the people in the first photo, I’m guessing that they were the store employees, but the man on the far right stands out. All of the other men are wearing a bow tie and vest or jacket, and he is wearing overalls and a work shirt. Perhaps the others were clerks, and he was the delivery man? Like many small towns, the building had multiple uses; aside from being a general store, the post office was also located here, and the second floor was used as the Masonic Lodge. The post office and the Masons were here until the building was demolished in 1957, and today the site is occupied by a commercial building that for many years housed the Louis & Clark drugstore. The watering trough for horses is long gone, although its modern equivalent, a gas station, is directly across the street from here. The Masonic Temple at the corner of Boylston and Tremont Streets, facing east on Boylston in the late 1860s. Photo courtesy of Boston Public Library. 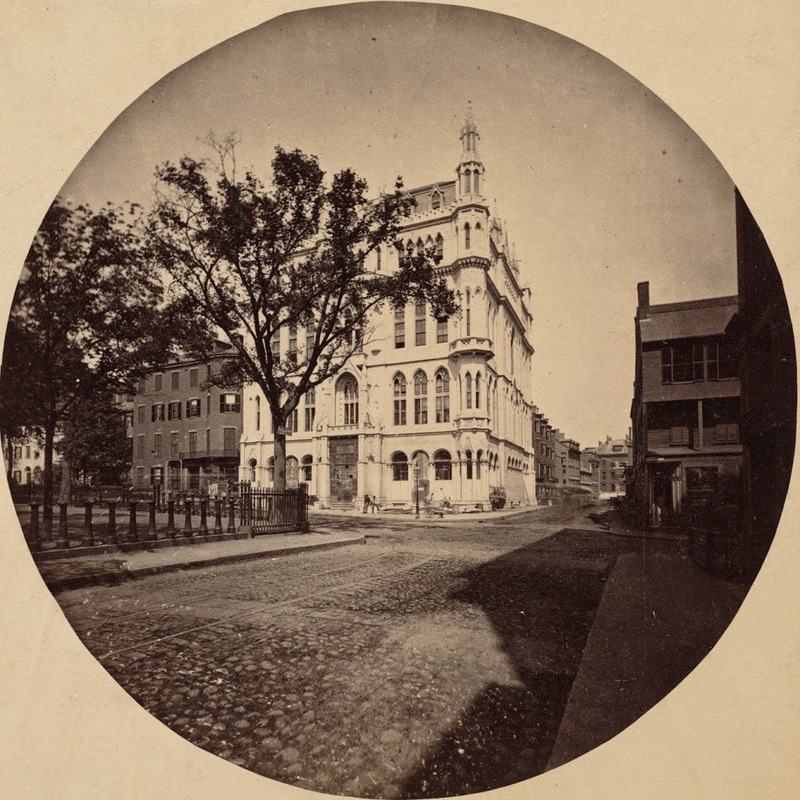 According to the Boston Public Library, the first photo was taken in 1864, which is unlikely considering the building in the photo wasn’t built until 1867. 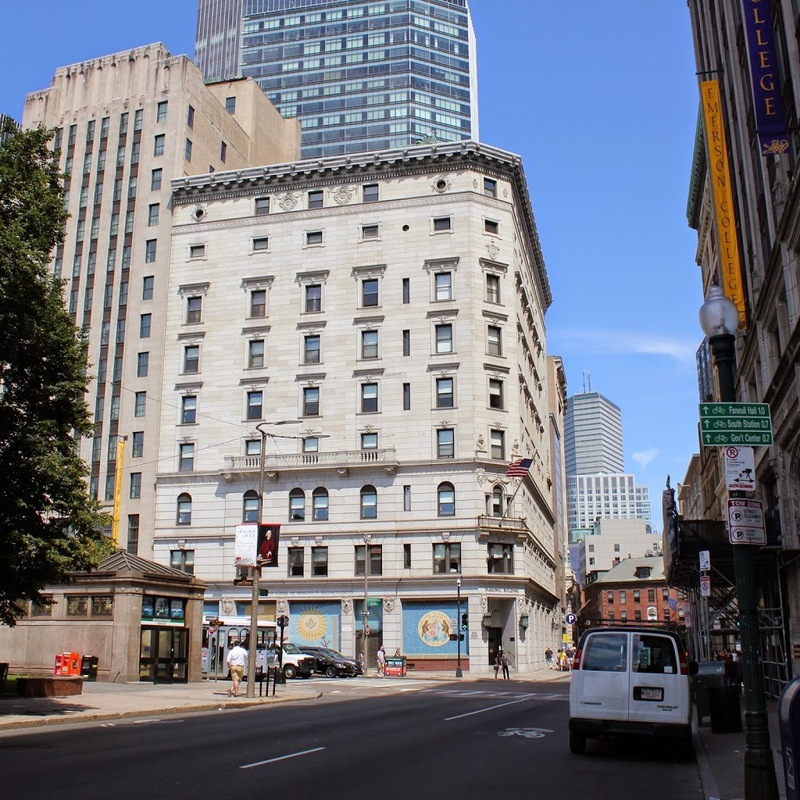 This site at the corner of Boylston and Tremont Streets has been home to the Grand Lodge of Massachusetts since 1859, starting with the Winthrop House, which burned in 1864. It was replaced with the building in the first photo in 1867, and this building likewise burned, in 1895. The present-day building was completed in 1899, and has been home to the lodge ever since. A number of other changes have taken place here, with most of the 4-5 story residential and commercial buildings being replaced over the years by successively taller structures. Today, only one building from the first photo still survives – the 1850 Liberty Tree Building a block down Boylston Street, seen in the 2014 photo directly behind the white van. Another significant change is the Boylston station, seen on the left of the 2014 photo, which opened on Boston Common in 1897 as one of the first two subway stations in the United States. The old Masonic Building in Springfield, around 1910, from The View Book of Springfield (1910). The old Masonic Building at the corner of State and Main was built around 1893, and was used by the Masons until 1924, when they built a new temple further up State Street. At some point, the ornate sandstone facade was replaced with a more bland brick appearance, and the clock tower was either moved back or replaced entirely. However, there is a small surviving part of the original facade – the sandstone arch above the doorway on the left-hand side is still there, complete with a Masonic symbol above it. 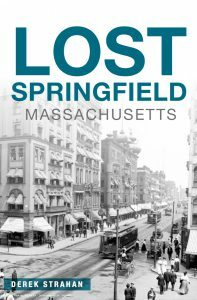 Order your autographed copy of Lost Springfield, Massachusetts today! 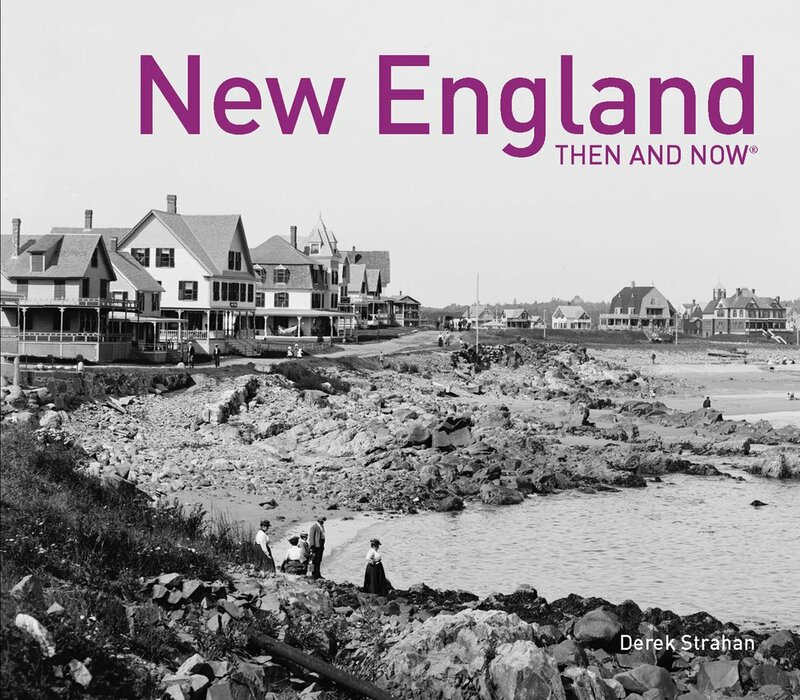 New England Then and Now is now available! Unless otherwise specified, Lost New England does not own or claim rights to any of the historic images used on this site. Many of these images are in the public domain, but some may still be under copyright protection, and are used here under an appropriate license. All other content on this site, including modern photos and text, is Ⓒ 2005-2019, Lost New England, All Rights Reserved.